Sri Sri Jagannath Ratha Yatra :: A Global Festival for Hindu unification :: Hare Krishna !!! 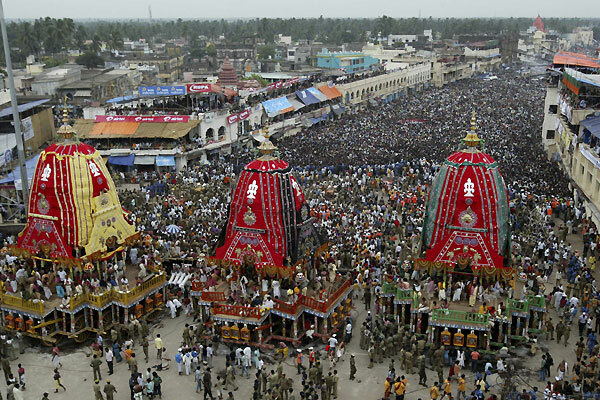 Lakhs of devotees thronged and participated in Puri for Ratha Yatra – Car Festival today. Three Rathas safely reached Gundicha Temple near evening. Utter satisfaction caused to the devotees. Read here….eBS. Lakhs of devotees in Sri Jagannath Ratha Yatra - Car Festival at Puri 2011. Current view from AP. Sri Sri Jagannath Ratha Yatra 2011 starts. HE Correspondent from Puri || 3rd July 2011. Famous sand artist Sudarsan Pattnaik made a beautiful replica in Puri Sec beach. Sri Sri Puri Jagannath Rath Yatra or Chariot festival of Jagannath Puri is one of the largest religious ceremonies in Bharat (India) and the world too. Puri Jagannath Rath Yatra dates on 3rd July , Sunday, this year 2011. 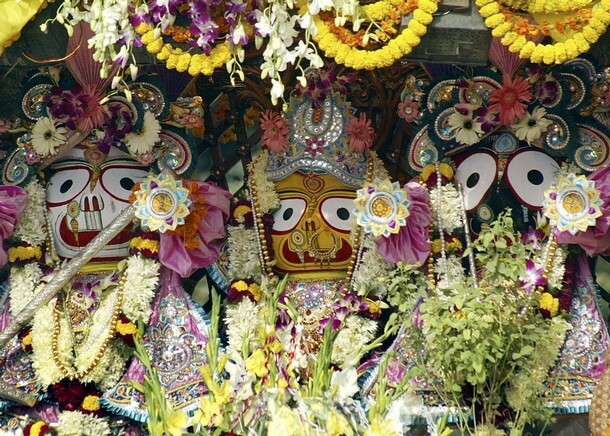 Puri Rath Yatra commemorates the significant journey of Lord Krishna from Gokula to Mathura. This annual festival is celebrated on Ashad Shukla Dwitiya (second day in bright fortnight of Ashad month). As a part of Rath Yatra, the sacred wooden idols Lord Jagannath, Lord Balabhadra and Mother Subhadra are taken out from the sanctum sanctorum of world famous Puri Jagannath temple in a large procession of millions to the Gundcha Temple and remain there for nine days. In three separate Chariots, eye balls of the devotees complete their journey in phases capturing all attentions for more than 8 hours. Then the deities are returned again to the Puri Jagannath temple through a Return Charriot Yatra (Ultto Ratha) after observing certain rituals. The return journey in Puri is also known as Bahuda Yatra. For the rath yatra, three huge chariots – each with about a dozen wheels up to 7 feet in diameter – are ritually pulled through the streets, from the Jagannath temple to the temple of Gundicha Mandir. The Raths are replicas of the Jagannath temple and each of them carries an idol – of Jagannath in Nandighosa Ratha, of his brother Balbhadra in Taladhwaja Ratha and his sister Subhadra in Dwarpadalana Ratha. 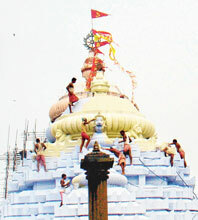 New painting at temple top to make a colorful celebration at Puri Rath Yatra. Rituals of Puri Ratha yatra begins formally on Akshay Tritiya through the Chandan Yatra, when the making of the chariots and sandalwood paste offering to the deities are started. All are now set to have a glimpses on to Lord Jagannath, with a chanting… “Jagannatha Swami, Nayana Patha Gami, Bhabatu Me” – Oh! Lord please be visible once before my eyes !!!….. It is believed that the rebirth cycle is ceased as one sees the Lord in his Charriot at Puri Ratha Yatra. “Rathapori Vamanm dristva Punarjanma na vidyatee”….. The Railways authority in India has arranged specials trains for Ratha Yatra Festival this year also like previous years. A big arrangements are aslo done by the respective authorities to facilitate the thousands of pilgrims already reached Sri Dham Puri. Hundreds of NGOs including Bharat Sevashram Sangha run their Seva Works for the thousands pilgrims assembled in thousands and lakhs every year. Some 5000 devotees took part on Saturday morning, during the whole day in “Gundicha Marjan”, cleaning of Gundicha Temple premises, where the Lord Jagannath will reach in some moments with his elder brother and younger sister through the auspicious Rath Yatra, which is nothing but the direct interaction of Lord of this Universe with his devotees to get this chance in streets to the hearts. The chariot Festival is now considered as a major festival in the Global hindus as every continent and mojor cities are absorved with the fervor o Charot estival of lord Jagannath. ISKCON is the main organisation for for this. Hare Krishana !!! Bhagwan Jagannath’s 134 Rath yatra in Ahmedabad. Ahmedabad, 2 July, 2011 || Courtesy : Desh Gujrat. On the eve of Bhagwan Jagannath’s 134 Rath yatra in Ahmedabad, Gujarat Chief Minister Shri Narendra Modi today visited the Mandir and received blessings of Mahant Shri Dilipdasji Maharaj. Shri Modi expressed hope that Bhagwan Jagannath’s blessings will shower on Gujarat in the form of arrival of monsoon and it will shower happiness over the towns, villages, poor people and farmers. The Chief Minister further said: spiritualism is identity of India and its expression takes place through various celebrations in the country. 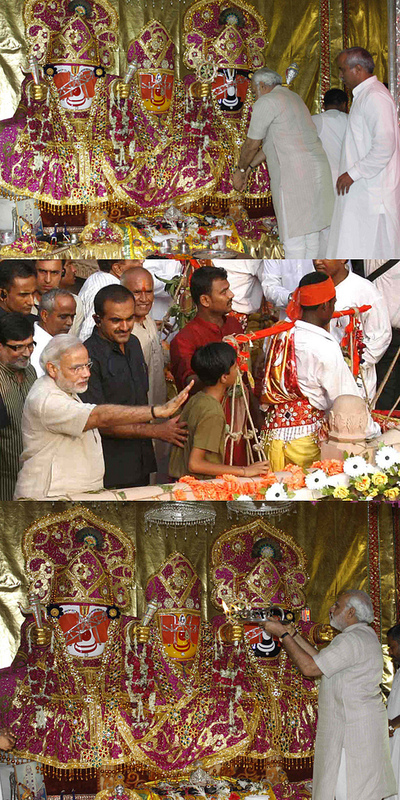 In entire country Jagannath Puri and Ahmedabad are two places where Rath yatra takes place for last more than 100 years. Bhagwan Jagannath is the God of poor people. He is concerned about happiness and sorrows of poor people. This is therefore the festival of poor people. See details Pictures and Video << here. Dhamrai Jagannath Rath is a chariot temple dedicated to the God Jagannath located in Dhamrai, Bangladesh. The deities are housed in an elaborate six storied wooden chariot and are taken out in a grand annual procession known as the Rathyatra. the Chariot is adorned by carvings and paintings of Hindu deities. The Rathyatra is the oldest and most famous in Bangladesh attracting thousands of devotees from all over the country. It was started by Raja Josho Pal who found a Vishnu Statue in the forest. The name of the statue was after the name of the Raja JOSHOMADHOB. The Annual Rathayatra was famous because of the 80-foot-tall chariot built by the Zamindars of the region during the 19th century. This Chariot was burnt by the Pakistani Army during the 1971 war and has since been replaced by 27 foot tall Chariot. Few Years back Indian Govt. helped to reconstruct the chariot. Every year in Ashaŗh Month (according to bangla calender) in the shukla ditiya thithi the Rathayatra takes place. This year(2011) it is in the 3rd July. The religious ceremony will end on the 11th July,2011. This 9 days the rituals continue. But the local festival will continue for one month. Traditional Home Made showpieces are available in this fair. Circus party will also come. This entry was posted on July 3, 2011 by hinduexistence in Hindu Celebrations, Hindu Festivals, Hindu Pilgrimage, Hindu Puja, Hindu Rituals, Hindu Scriptures and Hindu Research, Hindu Temples, Uncategorized, World Hindus and tagged Ahmedabad ratha Yatra 2011, Bharat Sevashram Sangha., ISKCON, Puri Jagannath Dham, Puri Ratha Yatra 2011.